alaTest has collected and analyzed 782 reviews of Motorola Moto G5 Plus. The average rating for this product is 4.5/5, compared to an average rating of 4.1/5 for other Cell phones for all reviews. Reviews about the size and price are generally positive. The battery and camera also get good views, but reviews about the sound and portability are different. We analyzed user and expert ratings, product age and more factors. Compared to other Cell phones the Motorola Moto G5 Plus is awarded an overall alaScore™ of 92/100 = Excellent quality. 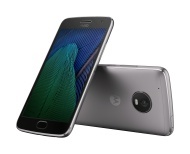 The Moto G5 Plus puts premium smartphone features like a metal body, new shortcuts and 4K video into a budget package. The splash-resistant Moto G5 Plus has a near stock version of Android Nougat, a good camera and video, and a metal build -- and it's extremely kind to your wallet. There's no NFC on the US model, and audio sounds tinny through the built-in speaker.